In vivo anticlastogenic effect of silymarin from milk thistle Silybum marianum L.
OBJECTIVE: Silymarin, extracted from the seeds of Silybum marianum L. (Milk thistle), is traditionally used for treating various illnesses such as diabetes, cancer, inflammation, hepatitis, liver cirrhosis, and renal problems. Acute cytotoxicity and genotoxicity studies have been reported with ambiguous outcomes; however, its relevant anticlastogenic potential is not yet evaluated. This study was aimed to evaluate in vivo subacute anticlastogenic properties of silymarin to validate its use as a medicinal agent. MATERIALS AND METHODS: Silymarin was isolated from seeds of milk thistle. Various genotoxicity bioassays of silymarin were performed using mice. First, the bone marrow cell proliferation was estimated by calculating mitotic index. Second, the chromosomal abnormalities in mice bone marrow cells were studied. Third, micronucleated polychromatic erythrocytes (MPE) test and in vivo activation of sister chromatid exchanges (SCEs) were carried out in mice bone marrow cells. Finally, primary spermatocytes were analyzed to estimate genotoxic effect of silymarin on germ cells. RESULTS: We found that silymarin is capable of inducing a significant increase (P ≤ 0.05) in cell proliferation of bone marrow cells. There is no increase in chromosomal aberrations following silymarin treatments. Results clearly showed that it significantly (P ≤ 0.05) decreased the MPE. Likewise, it was found to be a negative inducer of SCEs. It decreased in total abnormal metaphase, SCEs, MPE, and aberrant diakinesis. CONCLUSION: The results demonstrated that silymarin has a strong anticlastogenic activity upon mice genome in somatic and germ cells, indicating its safe use as a medicinal substance. Furthermore, it is not only safe but also has protective effect from clastogens. Analyzing genotoxicity of any substance, researchers study for DNA damage in cells treated with the toxic substrates. DNA damage by this toxic substrate can be manifested as single or double strand breaks, depletion of excision repair, cross-linking, alkali-labile sites, point mutations, structural and numerical chromosomal aberrations (CA). This damage can be observed either in somatic cells or germs cells to be transferred on to future generation. Silybum marianum L (milk thistle), is a herbaceous plant that belongs to the family “Asteraceae,” indigenous to North Africa and the Mediterranean and grows in the wild of Europe, Americas and Australia. The fruits are small (6–8 mm) long flat, dark brown, hard, smooth, and shiny, containing 1.5%–3% silymarin composed of an isomeric mixture of flavonolignans compromising of dihydroflavonol, taxifolin (TXF) and the flavanolignans, silychristin (SCN), silybinin (SBN), silydianin (SDN), and isosilybinin (ISBN). Silymarin, prepared from milk thistle, has been extensively reported to have a range of medicinal values. It is found to reduce biliary cholesterol, hepatic damage, intervene with cancer, treats liver, spleen and gallbladder disorders, and acts as an anti-inflammatory and anti-diabetic agent. It also lowers glucose and lipid levels in diabetics and its medicinal value in managing hepatic disorders was reported. The drug is available worldwide in the form tablets or capsules under different commercial names in proprietary blend of concentrated extracts, containing various concentration of silymarin ranging mainly from 140 mg (CAPI Co, Cairo, Egypt) to 1000 mg (Pure Formulas Co., FL, USA). As such, silymarin is known as a safe herbal product, and to date, there is no documented adverse side effects, or dangerous interactions have been noted; however, it is not strictly controlled. The United States Food and Drug Administration has not been able to regulate silymarin commercial products as there is no assurance of strength and/or purity and the activity may vary. Therefore, there is a need to prepare a pure silymarin product, and apply reliable assay systems for detecting whether silymarin is a potential mutagen; carcinogen; and/or clastogen. This work aimed at testing silymarin from the seeds of milk thistle S. marianum for possible clastogenic and anticlastogenic properties in vivo for subacute period to validate its use as a medicinal substance available worldwide. Cyclophosphamide, Colcemid, bromodeoxyuridine (BrdU) tablets Giemsa dye, standard silymarin flavonolignans (S0292), and reagents (methanol and acetic acid) were purchased from Sigma-Aldrich Co, USA. Seeds of milk thistle were collected between July and August, from the flower heads of the plant, grown on the rocky slopes of the middle of Sarawat mountains range known as Sarat Albaha region that rises up to 2800 meters in South Western Saudi Arabia. The sample was identified by Prof. Naser Abdulla Awad Ali of Pharmacognosy Department, College of Clinical Pharmacy, Albaha University; voucher specimen (A530) is stored in the herbarium of Pharmacognosy laboratory. Dried seed (150 g) were grounded with a household grinder until the average size of particles was <0.5 mm, identified with microscopy and were extracted with 80% v/v ethanol (3 L) by 2 weeks' cold percolation. The alcoholic extract was subjected for drying under reduced pressure, and then, it was fractioned into ethyl acetate soluble portion. The extract was subsequently evaporated in vacuo to yield 16.1 g dark brown viscous mass, representing around 6.5% of dried seed powder. Ethyl acetate fraction is used because to have defatted product. Quantitative analysis of flavonolignan compounds present in silymarin was carried out using high-performance liquid chromatography (HPLC), essentially as described by Wallace et al. 2003. The determination of flavonolignan compounds in methanolic solution of silymarin extract samples (1.2 mg/mL) by HPLC was carried out using a Perkin Elmer series 200 (USA) with a PE-1050 pump and 7125 injector model with a 500 μL final volume loop. PE-1040M photodiode-array was the detection system. The column was a C18 (15 cm × 4.6 mm Internal Diameter, Perkin, USA). The sample injection volume was 50 μL. Methanol: Water (50:50 v/v) was used as mobile phase and the elution was done successively with various ratio of petroleum ether: Chloroform (9:1, 8:2, 1:1 v/v) and ratio of chloroform: Methanol (99:1 v/v) at 1 mL/min of flow-rate. The column was maintained at 45°C. Detection was done at 288 nm. To identify flavonolignan compounds in the sample, the standard Silymarin solution was run together with the sample. Peak-area ratios and internal standard method were used for calculations. The sample was analyzed in triplicates and the results reported as means. Dilutions of the filtered methanolic standard stock solution of Silymarin (Sigma-Aldrich Co., USA), using Whatmann No. 42 filter paper, were prepared to establish a calibration curve. Overlay absorption spectra at 288 nm of concentrations of 4.0, 6.0, 8.0, 10.0, 12.0, 14.0, and 16.0 μg/mL of silymarin were recorded. Male mice, Mus musculus, aged 9–12 weeks with body weight (BW) 40–50 g were obtained from NAMRU-3, Cairo, Egypt. The animals were adapted to standard laboratory conditions in wire cages for 2 weeks under room temperature of 22°C and exposed to daily photoperiod of light (14 h) followed by dark (10 h). Animals were fed with standard oval pellets, (LabDiet ®, St. Louis, MO 63144, USA). All experimental steps were conducted according to the international guidelines (Guide for the Care and Use of Laboratory Animals, Institute of Laboratory Animal Resources, Commission on Life Sciences, National Research Council, U.S.A.; National Academy Press: Washington D. C., 1996), including the care and handling, feeding, scarification of the animals and approved by Institutional Animal Ethics Committee (IAEC/352/233/2015). Average daily recommended dose of silymarin for an adult human (65 kg) was estimated at 250 mg. Minimum daily dose of silymarin administered per mouse was calculated as (Daily silymarin dose per mouse = recommended human dose/average adult human BW [gm] X mouse average BW [gm]), i.e., 250/65,000 × 45 = 0.173 administered in daily doses of 0.173 mg/day for 21 successive days; giving a total dose of 3.65 mg (rounded to 4 mg); equivalent to approximately 4 mg/kg BW. Tested doses of silymarin were chosen at lesser and >4 mg/kg BW. In preparation for feeding, mice were held as comfortable and relax as possible. Silymarin was administered orally using appropriate size disposable flexible sterile plastic feeding tubes Model FTP-22-25, 22 ga × 25 mm (1.2 mm diameter) with soft rounded tip (Instech, PA, USA). Mice were divided into groups of five animals each as recommended by ICH guidelines, corresponding to four treatments group with silymarin alone, 2 mg/kg, 4 mg/kg, 8 mg/kg, and 20 mg/kg BW, four treatment groups with silymarin at 2 mg/kg, 4 mg/kg, 8 mg/kg, and 20 mg/kg BW, combined with the positive control (PC) cyclophosphamide (Indoxan) at 25 mg/kg BW, each group of positive and negative control. Animals of the negative control group received equivalent amounts of deionized water. Each animal was injected with 0.1 mL colcemid (20 mg), 21 h after applying the last dose of treatment. Animals were decapitated 24 h after the last dose, except for the analysis of primary spermatocytes (PS), where animals were decapitated 10 days after the last dose. Animals were sacrificed and cervical dislocation technique was applied to remove both animal femurs, extraneous tissues and bone tips were discarded to allow a 26-gauge syringe needle to be inserted to flush out the femoral contents with phosphate buffered saline (pH 7.0). Cell suspension around 8 mL was microfuged at 1000 rpm (5 min), and cell pellet was recovered. The pellet was resuspended in 8 mL hypotonic solution of potassium chloride (0.075 M), and allowed to stand for 12 min before recentrifugation. The recovered cell pellet was fixed with a fixative solution (3 unit of methanol: 1 unit of glacial acetic acid v/v) for 10 min. The fixation process was repeated with each pellet obtained, resuspended in 5 mL fresh fixative solution and kept at 4°C overnight till examined. Furthermore, bone marrow smears were made according to Liju et al. From a feet distance, 2–3 drops of cells suspended in the fixative solution were dropped onto a glass side. Additional drops were added until cell density was dense enough. Slides were kept away from light until stained. Cells were spread, air-dried, and stained for 5 min with 10% Giemsa (pH 6.8). Bone marrow cell proliferation rate was estimated by calculating the mitotic index (MI) of stained cell smears, examined microscopically. The estimation of MI was based on at least 1000 cells using the equation (MI = No dividing cell/Total no. examined cells × 100). Approximately 200 metaphase Giemsa-stained bone marrow cells/dose/animals were microscopically examined for CA, such as stickiness, gaps, fragments, robertsonian centric fusions, and polyploidy, and compared with the control groups. 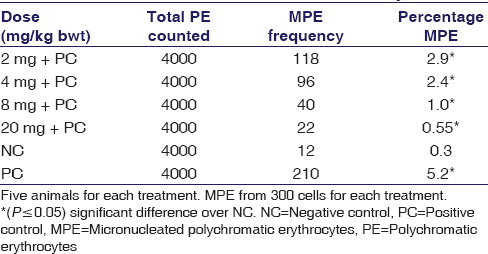 The frequency and relative size of micronucleus micronucleated polychromatic erythrocytes (MPE) were estimated from 300 cells using a method described by Yaduvanshi et al., and the analysis of data was performed according to Hart and Engberg-Pedersen. The spermatogenic cells were mechanically obtained from the mice testes using the procedure described by Adler. The fusion efficiency was increased by suspending cells in PBS saline solution, and applying 0.1 mg/mg Pronase E solution for 5 min at 30°C. The biggest cells with 18–20 μm in diameter in size with distinct nuclear membrane in the pachytene to diplotene stages of the meiotic prophase were investigated for CA. BrdU tablets were compressed using pellet press (Parr Instrument Company, Moline, ILLinois, USA) equipped with punch of 0.178” diameter as described by Allen et al., Portions of 200 mg mounting powder were mixed with the BrdU dye, and firmly pressed to maintain consistent compaction, hence dissolution rate among tablets. Tablets were kept in a freezer until used. Animals were anesthetized for about 2 min in a jar containing ether and restrained on their back with ether-wet tissue placed on the nose for a prolonged anesthetic effect. Approximately 1 cm subcutaneous incision was made with a clean scissor along the lower lateral region after been swapped with alcohol, and a deeper subcutaneous pocket was created using forceps, after inserting a tablet the wound was sealed using 2–3 out clip sutures. Silymarin treatments for sister chromatid exchange (SCE) analysis were done 8 h after BrdU tablet insertion. At 19 h after BrdU tablet insertion, each animal was injected with 0.1 mL Colcemid (20 mg) intravenously, in the tail vain. Slides were stained for 10 min in the dark  using 50 μ/mL Hoechst dye 33258, prepared in distilled water at pH 7. The preparation was rinsed in distilled water before adding a layer of Mcilvaine's buffer (18 mL of citric acid [1.92%] added to 82 mL of disodium phosphate [2%] and adjusted to pH 7). A coverslip was placed on each preparation, and slides were placed at 50°C warmed plate and exposed from a distance of about 2” to light intensity at 400 nm, for 20 min. Slides received a distilled water rinse before immersion into 10% Giemsa dye, then rinsed again in distilled water, and air-dried before examined by a light microscope. At least, 50 cells per animal was analyzed. Finally, cells were examined for mitotic spread for SCE under objective magnification of 25 X, and cell examination was carried out under objective magnification of 100 X. The frequency of SCE was scored from taken photographs of microscope fields of second division cells. Each interstitial exchange of chromatid segment was counted as two incidents of SCE. The statistical program SPSS® (2005) version 14.0 (SPSS Inc., Chicago, Illinois, USA) was used for data analysis. Data were expressed as percentage and mean ± standard error F-test and the least significant difference test were used for the analysis of variance among treatments at P ≤ 0.05. Data were subjected to Duncan's multiple range tests for the chromosomal abnormalities and SCEs studies. Silymarin was successfully extracted from the seeds of milk thistle. The ethyl acetate extract from 250 g dried seed powder yielded 25.1 g dark brown viscous mass representing around 10.05%. 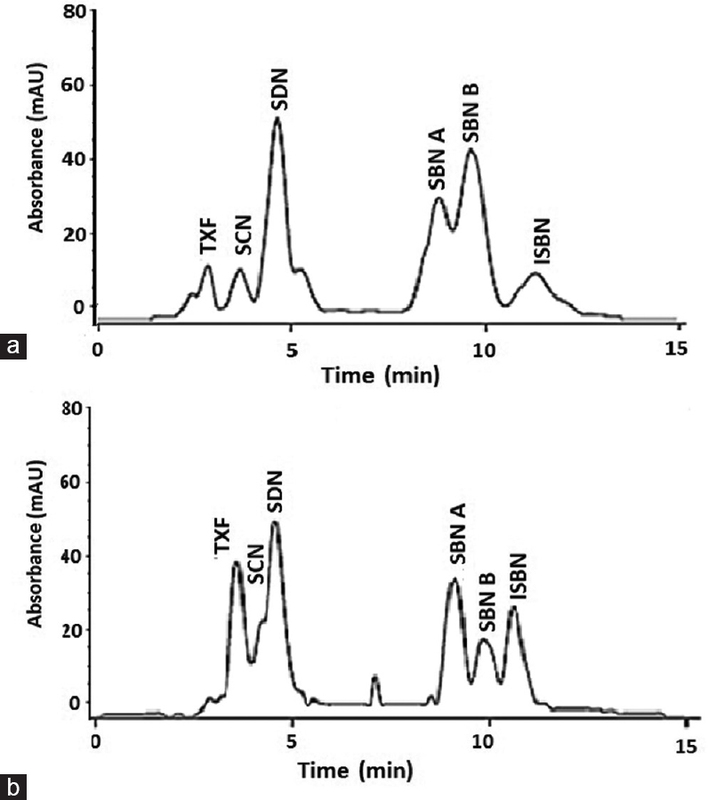 The chromatographic data of methanolic solution of silymarin sample and silymarin standard are presented in [Figure 1]. The chromatograms depict six principal peaks, each one represents individual flavonolignan component in the Silymarin samples. The peaks for TXF, SCN, SDN, SBN A, SBN B, and ISBN appeared at retention times of 3.6, 4.4, 4.6, 9.1, 9.7, and 10.7 min, respectively. In terms of the quantity, the total silymarin contents in dry seeds of plants were 21.66 μg/g (i.e., 2.2%), representing six silymarin flavonolignan constituents. The results illustrating the different types of aberrations induced by cyclophosphamide as a clastogenic are shown in [Figure 2]. The data [Table 1] show that the PC cyclophosphamide, at 25 mg/kg BW, resulted in exactly 50% reduction in the MI as compared to the negative control (8.2%). The MI increased in response to the treatments with silymarin at 2, 4, 8, and 20 mg/kg BW giving rise to 10.3%, 12.7%, 16.2%, and 16.8%, respectively. As compared to the negative control, the result gave evidence that all treatments with silymarin induced significant (P ≤ 0.05) increase in mitotic activity, and at 8 mg/kg and 20 mg/kg BW, silymarin achieved a 2-fold increase in the mitotic activity of bone marrow cells. 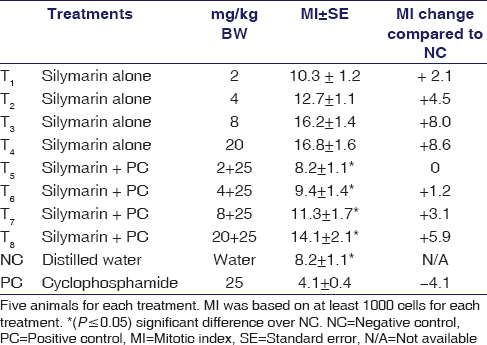 It is obvious from [Table 1] that the mitotic activity obtained after treatments with silymarin in combination with the PC, although was lower than that obtained after treatment with the silymarin alone, it was either equal to or even higher than the negative control, giving further evidence that silymarin counters the effect of cyclophosphamide. The CA results are summarized in [Table 2]. It was observed that there is no increase in CA following all silymarin treatments. However, treatment with the PC cyclophosphamide resulted in a significant increase (P ≤ 0.05) in the CA of different types; stickiness was the main aberrations. Treatment with silymarin combined with cyclophosphamide revealed that the levels of silymarin used had a positive effect on decreasing CA. It clearly showed that silymarin is able to decrease the MPE significantly (P ≤ 0.05) [Table 3]. Therefore, it designates that it plays an important role as anticlastogenic agent. PC was found to have clastogenic effect and silymarin proved to have anticlastogenic activity. The analysis of PS showed that treatment with the different doses of silymarin significantly (P ≤ 0.05) reduced different types of aberrations at diakinesis stage as compared to the PC as outlined in [Table 4]. The effect of silymarin on in vivo activation of SCEs are summarized in [Table 5] that shows the average of SCEs obtained after treatment with the different doses of silymarin as compared to the negative and PC groups. It is observed that silymarin, is not only a negative inducer of SCEs, i.e., a negative inducer of primary DNA damage, but it also plays a role in repairing primary DNA damage. Moreover, we performed Duncan's multiple range test as presented in [Table 6], indicating that all tested doses were significantly (P ≤ 0.05) different than the PC. Comparing the negative control means SCEs and that after the treatment with 20 mg/kg BW, significantly decreased (P ≤ 0.05) the frequency of SCEs to almost the third of that occurred in the negative control, giving evidence that silymarin has a specific capability to repair DNA lesion. Previously silybin, SCN, SDN, isosilybin and other organic polymer fraction was identified in silymarin extract., As per Organisation for Economic Co-operation and Development (OECD) guidelines, acute genotoxic testing is carried out up to maximum tolerated dose whereas subacute or chronic testing can be carried out with repeated small doses. Aneuploidy such as potent spindle poisons caused by many compounds that are observed within a narrow range of doses proceeding toxic doses, in in vivo micronucleus assays in bone marrow or blood samples. Furthermore, in vivo studies takes in consideration of metabolite of testing compounds which can give rise to genotoxicity. Our study is subacute period of 21 days of treatment, aimed at detecting complete genotoxicity. It is recommended for mutagenicity testing to include negative and PC groups. As per Preston et al., PCs gives test to test and animal to animal variations, and to validate the sensitivity of a particular test. However, cyclophosphamide is a clastogenic inducer in many animal species and has been suggested in cytogenetic studies., Bone marrow cells are studied for any CA test, and it is widely used for regulatory submissions. The total aberrant metaphases ranged from 11% to 26%, with stickiness at highest frequencies, and the PC induced the highest frequency in stickiness, perhaps due to an alteration in the net charge of chromosomal proteins histones and acidic proteins or DNA itself. As per the OECD guidelines, test compound passes when none of the treatment groups shows statistically significant increase in the frequency of cells with structural CA (excluding gaps) compared with the negative control. Our results shown in [Table 2], followed these criteria. Furthermore, micronucleus test (MPE) is one of the reliable and most successful assays for screening potential genotoxic compounds. Our data reveal that there was a decrease in MPE. Therefore, it designates that silymarin plays an important role as anticlastogenic agent. PC was found to have clastogenic effect and silymarin proved to have anticlastogenic activity. Similar results have been reported by Kaleeswaran et al. and Zhao and Lifor acute treatment period , but our data support for subacute period of 21 days. These data demonstrate that silymarin does not possess any genotoxic properties. In germ cells, heritable gene mutations, numerical and structural chromosome aberrations are induced by germ cell mutagens; because of germ cell mutations genetic, phenotypic changes without signs of illness, or fertility decrease, or embryonic or perinatal death, almost congenital malformations or genetic diseases with particular health impairment are observed in future generations. Study of micronuclei and other nuclear anomalies in tissues rather than bone marrow can be helpful for screening and quantifying anomalies in germinal cell. Our data of analysis of PS data further supported that silymarin plays a role as an anticlastogenic agent in germinal cell of mice. SCEs are a process of both DNA strands breaks, followed by an exchange of whole DNA duplexes. This process occurs during S phase and is caused by mutagens by forming DNA adducts or interfering with DNA replication. The initiation of SCEs is correlated with recombinational repair and point mutations induction, amplification of gene and cytotoxicity. In laboratory toxicology testings, SCE performed with nonradiolabel detection methods considered as genetic markers for identifying potential genotoxins/mutagens. SCE for normal distribution per mitosis is 4–5 SCE per chromosome pair, but 14–100 exchanges are not normal and considered as danger to the organism. Silymarin treatment has shown normal SCE distribution; and furthermore, it reduced SCE giving evidence that silymarin has a specific capability to repair DNA lesion. Our results substantiate evidence that silymarin has a strong anticlastogenic activity on mice genome in somatic and germ cells studies demonstrated for subacute period of 21 days. It has the capability to lower the induction of SCEs, giving an evidence that it plays an important role in repairing primary DNA damage. This effect may be due to the role of silymarin as an antioxidant, and perhaps as a DNA stabilizing agent. In contrary some findings reported for clastogenic and DNA damaging effect of silymarin by comet assay, these findings are not relevant since these studies are carried out for acute pretreatment of silymarin, with a high dose of cyclophosphamide. Therefore, the use of silymarin as a drug to treat various diseases is not only safe but also have its anti-mutagenic activities warranted. The authors would like to thank Agriculture Research Centre and Genetic laboratory, Egypt, for this work. Marques ES, Salles DB, Maistro EL. Assessment of the genotoxic/clastogenic potential of coumarin derivative 6,7-dihydroxycoumarin (aesculetin) in multiple mouse organs. Toxicol Rep 2015;2:268-74. Rao PR, Kaul CL, Jena GB. Genotoxicity testing, a regulatory requirement for drug discovery and development: Impact of ICH guidelines. Indian J Pharmacol 2002;4:86-9. Nagarathna PK, Wesley MJ, Reddy SP, Reena K. Review on genotoxicity, its molecular mechanisms and prevention. Int J Pharm Sci Rev Res 2013;22:236-43. Alaoui IS, Harhar H, Gharby S, Bourazmi H, Tabyaoui M, Kitane S, et al. Chemical composition of two non-conventional oils in Morocco: Melia azadirachta and Silybum marianum (L.). J Mater Environ Sci 2016;7:2208-13. Napolitano JG, Lankin DC, Graf TN, Friesen JB, Chen SN, McAlpine JB, et al. HiFSA fingerprinting applied to isomers with near-identical NMR spectra: The silybin/isosilybin case. J Org Chem 2013;78:2827-39. Karimi G, Vahabzadeh M, Lari P, Rashedinia M, Moshiri M. “Silymarin”, a promising pharmacological agent for treatment of diseases. Iran J Basic Med Sci 2011;14:308-17. Posadzki P, Watson LK, Ernst E. Adverse effects of herbal medicines: An overview of systematic reviews. Clin Med (Lond) 2013;13:7-12. Dietary supplements – Popularity, Quality, Safety, Efficacy. Available from: https://www.drlevyhealthinfo.com/dietary-supplement-popularity-quality-safety-and-efficacy. [Last accessed on 2016 Sep 30]. Khan SA, Kumar S, Mujeeb M, Maqsood AM. Isolation of aliphatic carbonyl hydrocarbons and in vitro antioxidant activity of Silybum marianum seeds. Int J Interdiscip Multidiscip Stud 2014;1:15-20. Wallace SN, Carrier DJ, Beitle RR, Clausen E, Griffis CL. HPLC-UV and LC-MS- MS characterization of silymarin in milk thistle seeds and corresponding products. J Nutr Func Med Foods 2003;4:37-48. Food and Drug Administration, HHS. International conference on harmonisation; guidance on S2(R1) genotoxicity testing and data interpretation for pharmaceuticals intended for human use; availability. Notice. Fed Regist 2012;77:33748-9. Lutz M, David T, Sheila G, Makoto H. The evolution, scientific reasoning and use of ICH s2 guidelines for genotoxicity testing of pharmaceuticals. In: van der Laan W, DeGeorge JJ, editors. Global Approach in Safety Testing. 1st ed. New York: Springer; 2013. p. 77-118. Liju VB, Jeena K, Kuttan R. Acute and subchronic toxicity as well as mutagenic evaluation of essential oil from turmeric (Curcuma longa L). Food Chem Toxicol 2013;53:52-61. Yaduvanshi SK, Srivastava N, Marotta F, Jain S, Yadav H. Evaluation of micronuclei induction capacity and mutagenicity of organochlorine and organophosphate pesticides. Drug Metab Lett 2012;6:187-97. Hart JW, Engberg-Pedersen H. Statistics of the mouse bone-marrow micronucleus test: Counting, distribution and evaluation of results. Mutat Res 1983;111:195-207. Adler ID. Cytogenetic test in mammals. In: Venitt S, Parry JM. editors. Mutagenicity Testing, a Practical Approach. Washington D.C: Oxford IRL Press; 1984. p. 256-306. Allen JW. A method for conducting “in vivo” SCE Induction Analysis in Mice. Genetic Toxicology Division U.S. Environmental Protection Agency. Vol. 27. North Carolina: Res Triangle Park; 1982. p. 7-11. Abderrahman SM, Jamal Shbailat S. Genotoxic and cytotoxic effects of Artemisia herbaalba on mammalian cells. Caryologia 2014;67:265-72. Bogiatzi S, Pagonopoulou O, Simopoulou M, Kareli D, Kouskoukis A, Koutka Z, et al. 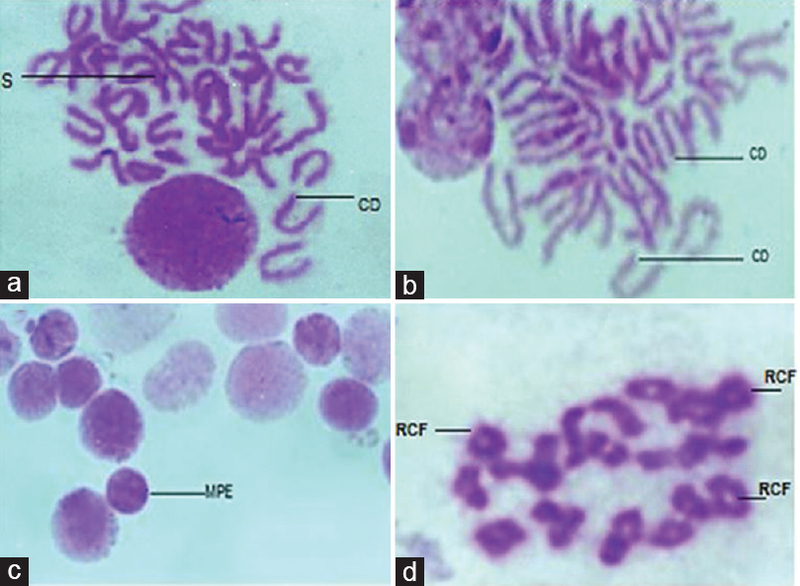 The cytogenetic action of ifosfamide, mesna, and their combination on peripheral rabbit lymphocytes: An in vivo/in vitro cytogenetic study. Cytotechnology 2014;66:753-60. Abenavoli L, Capasso R, Milic N, Capasso F. Milk thistle in liver diseases: Past, present, future. Phytother Res 2010;24:1423-32. Preston RJ, Dean BJ, Galloway S, Holden H, McFee AF, Shelby M, et al. Mammalian in vivo cytogenetic assays. Analysis of chromosome aberrations in bone marrow cells. Mutat Res 1987;189:157-65. Dar SA, Yousuf AR, Ganai FA, Bhat FA. Investigation of the genotoxicity of endosulfan to freshwater cyprinid fish crucian carp (Carassius carassius L.) using the micronucleus and chromosomal aberration as biomarkers. Nucleus 2014;57:87-98. Puli LK, Patil PA. Genotoxic evaluation of morphine, buprenorphine, pentazocine, and noscapine by micronucleus and comet assay in albino mice. Indian J Pharmacol 2007;39:265-8. Seehy MA, Badr EA, Hafez A. Genotoxicity of pesticides: II. Fluometuron and chlorpyrifos. Egypt J Genet Cytol 1990;18:59-76. OECD. Guideline for the Testing of Chemicals, Genetic Toxicology No. 475: mammalian Bone Marrow Chromosomal Aberration Test, Organisation for Economic Development and Co-operation, Paris, France; 26 September, 2014. Available from: http://www.oecd-ilibrary.org/environment/oecd-guidelines-for-the-testing-of-chemicals-section-4-health-effects_20745788. [Last accessed on 2016 Sep 30]. OECD. Guideline for the Testing of Chemicals, Genetic Toxicology No. 474: Mammalian Erythrocyte Micronucleus Test, Organisation for Economic Development and Co-operation; 21 July, 1997. Available from: http://www.oecd-ilibrary.org/environment/oecd-guidelines-for-the-testing-of-chemicals-section-4-health-effects_20745788. [Last accessed on 2016 Sep 30]. Kaleeswaran S, Sriram P, Vijay Kumar C, Mathuram LN. Genotoxic and antigenotoxic activity of silymarin by an in vivo bone marrow micronucleus assay and comet assay. Iran J Toxicol 2009;2:203-10. Zhao F, Li XH. Preliminary toxicology evaluation of silymarin. Adv Mat Res 2014;1049-1050:544-6. Yauk CL, Aardema MJ, Benthem JV, Bishop JB, Dearfield KL, DeMarini DM, et al. Approaches for identifying germ cell mutagens: Report of the 2013 IWGT workshop on germ cell assays. Mutat Res Genet Toxicol Environ Mutagen 2015;783:36-54. Morita T, MacGregor JT, Hayashi M. Micronucleus assays in rodent tissues other than bone marrow. Mutagenesis 2011;26:223-30. Asaithamby A, Chen DJ. Mechanism of cluster DNA damage repair in response to high-atomic number and energy particles radiation. Mutat Res 2011;711:87-99.